It is possible to run BrightstarDB as a web application under IIS. This can be useful if you want to integrate BrightstarDB services into an existing website or to make use of IIS-specific features such as authentication. The BrightstarDB service is a NancyFX application and so you can refer to the NancyFX wiki page Hosting Nancy with ASP.NET and other pages of the NancyFX wiki for in-depth details. However, we present here a simple way to get started using IIS to host BrightstarDB. The best option is to install BrightstarDB from the .EXE installer as this will create the web application directory for you. The rest of this short guide assumes that you have used the installer and have installed in the default location of C:\Program Files\BrightstarDB - if you installed somewhere else the paths you use will be different. You can skip this step if you are planning to add BrightstarDB to an existing site. In this example we are going to add BrightstarDB to the default website which, as you can see from the screenshot already hosts several other web applications. Right-click on the website and select “Add Application...”. In the dialog that comes up enter the alias for the application (in this example the application alias is “brightstardb”, but you can choose some other alias if you prefer). To set the Physical Path click on the ”..” button, browse to C:\Program Files\BrightstarDB\Webapp and click OK to choose that folder. For the application pool choose an existing application pool that runs .NET Framework version 4.0 with Pipeline mode: Integrated. 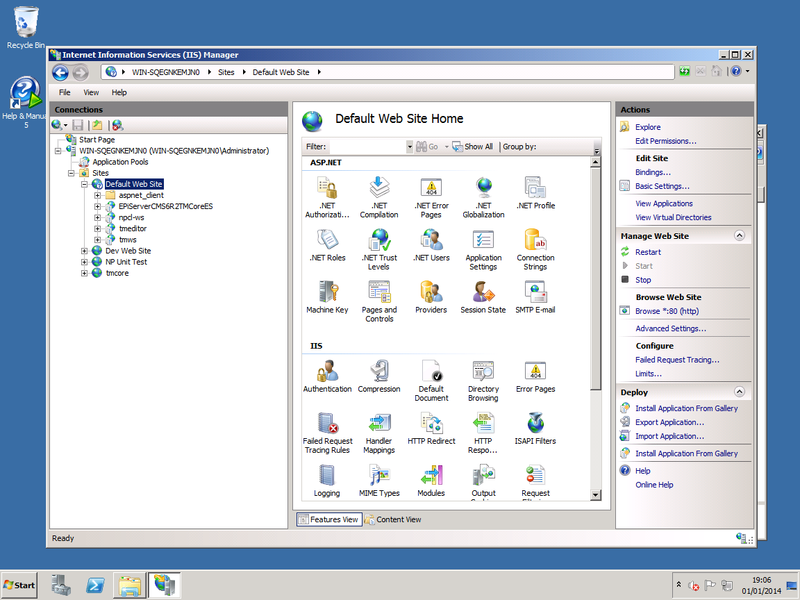 By default IIS7 has an app pool named ASP.NET 4.0 which has this configuration, but you may want to or need to choose another app pool or create a new app pool for running BrightstarDB. In any case, you should remember the name of the application pool you create and the identity that the application pool runs under. and change the path to the directory you want to use. 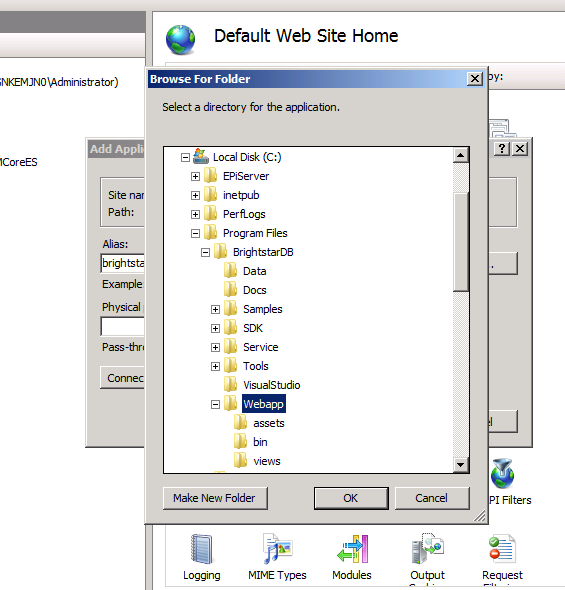 Use Windows Explorer to locate the data directory (if it does not already exist, create it). Now right-click on the folder for the data directory and select “Properties”. Go to the “Security” tab, and click on “Edit...”. Enter the identity of the application pool that is running the BrightstarDB web application. If the application pool is set to a local user identity, enter the name of the user here. If the application pool is set to use a domain user identity, enter the name of the user as DOMAINUser Name. If the application pool is set to use AppPoolIdentity, enter the name of the user as IIS AppPoolApp Pool Name. Click “OK” and then in the Permissions dialog check the box for “Full control” under the “Allow” column for the user you just added to the permissions. The result should be something like shown in the screenshot below. Click “OK” to exist the Permissions dialog and “OK” again to exist the Properties dialog.